Heat oven to 375°F. In large microwavable bowl, microwave broccoli & carrot mixture as directed on package, using minimum cook time. Meanwhile, in small bowl, mix flour, Parmesan cheese, butter and egg with pastry blender or fork until crumbly. Set aside. 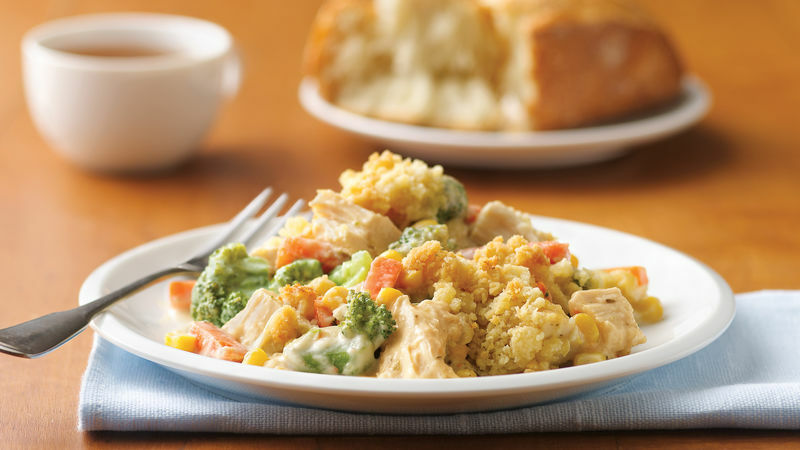 To hot vegetables in large bowl, add chicken, pasta sauce and corn. Stir gently to combine. Pour into ungreased 2-quart casserole or 9-inch deep-dish glass pie plate. Sprinkle with crumbly mixture. Two cans (5 oz each) tuna in water, drained and flaked, can be used in place of the chicken. Alfredo sauce comes in different flavor varieties. Experiment to find your favorite.